Did you have a good holiday? I hope so. I hope everyone had a Merry Christmas, Happy Hanukkah, and/or Festive Kwanzaa! Our family was in Austin for the week, at my parent’s house, so I took some time off from blogging to enjoy a little R&R. I hope Santa/Père Noel/Noel Baba/Topo Gigio or whomever you believe in, brought you lots of goodies. I’m still on the fence on how or if we’ll do Santa in the future (remember Halloween? ), but to actually survive the celebration was a success. Yay nurse! I bet a few of you are recovering from ringing in the New Year (can you believe we made it? ), so I wanted to share a few crunchy gifts that we received over the holiday. I’ve been rethinking the quality of gifts I give to my daughter, so I like the spin on the au-natural construction of these two. The first are ‘Lincoln logs’ made out of bamboo, called Bamboo Builders, by Schylling. My sis got some for her son from Whole Earth Provision Co. a while back, and I knew I wanted them for Emma, too. I love that it’s made from bamboo, the ultimate sustainable material. It’s naturally organic because it’s grown without pesticides or chemicals, is 100% biodegradable and is naturally regenerative. You can’t beat biodegradable and regenerative in my book! Thanks to my engineer hubby, we were able to recreate the log cabin on the container, and still had a few pieces left over. Phew! Her very first dollhouse! This beauty was made by my dad (Emma’s Granpy) and inspired by Young House Love. It’s a bit different than Clara’s, but Emma is in love…and so is her cousin, Dillon! I love the idea of a handmade gift (out of wood) versus store-bought (out of plastic). My mom (Emma’s Nonna) lovingly picked out the ‘wallpaper’ and accessories that went in each room, and I think it all looks adorable. It could definitely use some wall art, mirrors, or a lil somethin’ somethin’ to dress up those bare walls, though. Any ideas? Next on my crunchy list was this gift for my hubby. 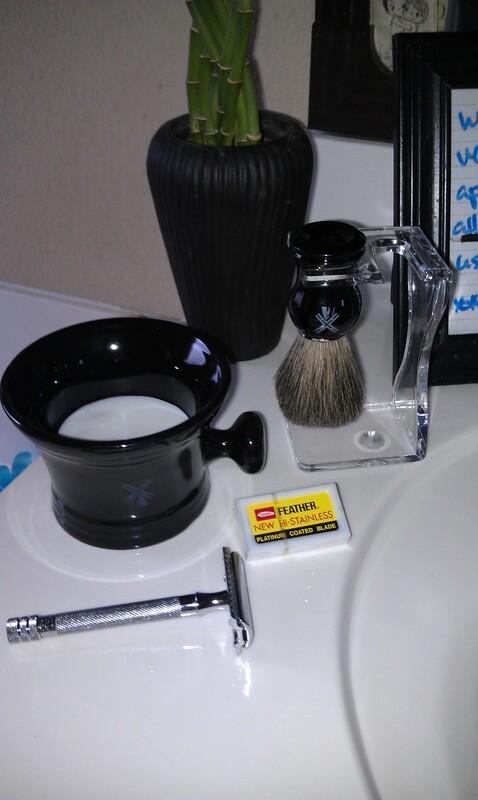 Safety Razor, shave set, and razor blades. Just in case you were curious about the food, it was mostly Paleo, save a non-Paleo stuffing and stupid gluten-free cakes and cookies! I went ahead and indulged myself, since I’m starting a sugar detox TODAY, with my friend Casey, and was SO over trying to be good. The pictured stuffing was from Unrefined Bakery and was a huge hit! We even had leftovers for breakfast a few days later to go along with our farm fresh eggs. I found these beauties from a sign on the side of the road. As for the turkey, we pulled out the one we got last year from Natural Grocers from the freezer and brought it with us. They sell Mary’s Free-Range Turkeys out of Sanger, CA, and it was delish! It makes me feel good to know I am eating a preservative, hormone, and antibiotic-free turkey with my entire family. If you know me, I saved the bones and made some fresh stock, which turned into turkey soup loaded with a bunch of veggies. All in all, the week in Austin was a success! It’s always nice to go to someone else’s home and have people help wash dishes, watch your child, and let you put your feet up cook the way you want. I can’t wait to tell you about a local place I found for Olive Oil and Balsamic Vinegar, located in Dripping Springs, TX! Until then, let me know how you celebrated the holidays. Did you have a big family gathering? Did you eat Paleo or gluten-free? Are you ready to write off sugar like I am, and would like to join me on my SUGAR DETOX 2013? Let’s Do This!